It’s really unbelievable to me that June is already over, but the calendar is insisting it’s true! So, here we go with Smyrna Parent’s June recap! This awesome Father’s Day DIY frame and printable. The frame can be done at any time for any occasion, so don’t let the Father’s Day theme deter you from checking this out! Information regarding the Smyrna Public Library and the Cobb County Public Library’s summer reading program, Fizz, Boom, Read! It’s based on hours reading (or being read to), and prizes start at the 2 hour mark, so there’s plenty of time to jump in and participate! Although it was just posted yesterday, it looks like this article on getting some exercise in with the little ones struck a chord with many of our readers. Smyrna Parents loved these tips for getting out and enjoying nature with your kids – no complicated pinning or planning required! And finally, our resources posts continue to be quite popular month after month. If you or a friend is looking for actual parent recommendations for things like pediatricians, hairdressers, dance classes, or sushi restaurants, check out our Reader’s Recommend series. The PMO/Preschool listing continues to get a lot of hits, as does the Summer Camp Guide. What other information can we compile for you?? There’s been a lot of local news lately, and unfortunately it hasn’t been all that uplifting. The AJC has compiled all articles and opinion pieces on Justin Ross Harris here. There have been a large number of car break-ins lately and they’ve mostly been crimes of convenience – in other words, we’re leaving our doors unlocked and items out in the open for them. 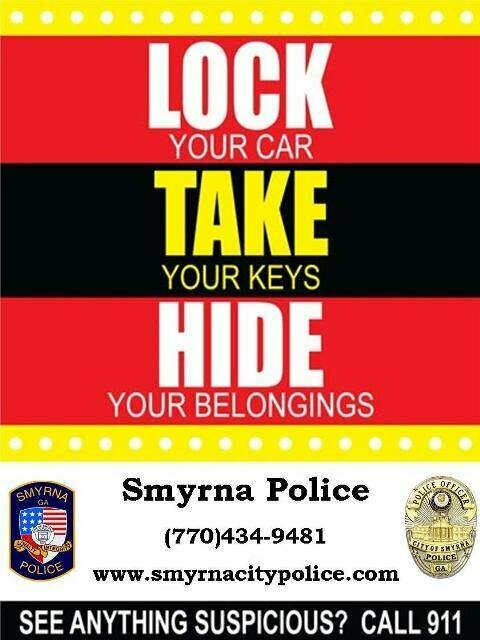 Here’s a reminder from the Smyrna Police Department to stop making things so easy for the bad guys. Girl power was strong this month, with this video from Always talking about what it means to do something like a girl and this “Inspire Her Mind” video from Verizon. While not directly parenting related, this article on songs of the summer going back to the 1960s will bring a smile to your face. A mom encourages us to put on that swimsuit and play. The NYT did a piece on the realities of post partum depression/maternal mental illness. Please check out all of our wonderful sponsors, who can be found on the Smyrna Parent main page. 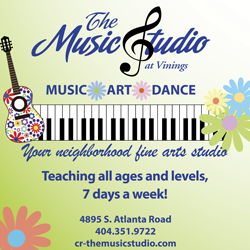 A special welcome to our newest sponsor, The Music Studio.